In two previous articles, we have explored the question: What is the classical approach to phonics? I have shown that Orton-Gillingham phonics, which is designed for students with dyslexia, is in every respect a classic traditional phonics program. 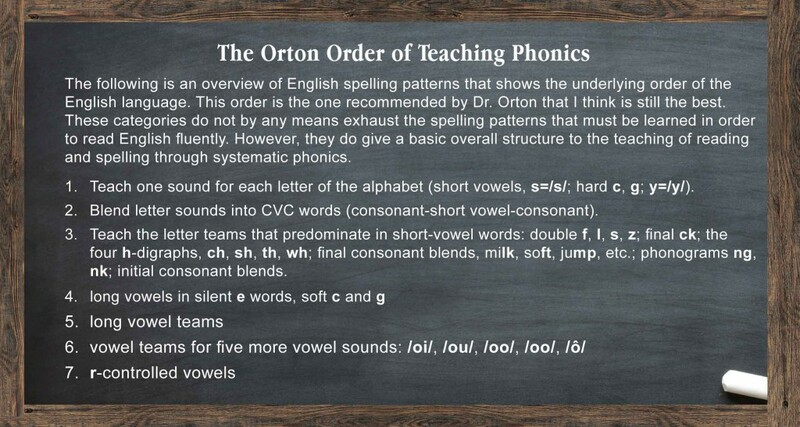 I have also shown that Romalda Spalding, in The Writing Road to Reading (WRTR), though she used the Orton phonograms, created a totally different approach to phonics that has little resemblance to Orton or to any other traditional phonics program. In the Spalding method, children are taught to recite all common sounds for each phonogram from the beginning, and then are expected to use these sounding and spelling rules to decode new words. In contrast, traditional phonics teaches each sound for phonograms one at a time and practices that sound in the context of word families. I think the appeal of Spalding is that the child who can recite all sounds of a particular phonogram from memory appears to have a level of mastery that the traditional phonics student does not. But is this an effective way to teach reading? Let me illustrate the difference. The WRTR student learns the sounds of the phonogram ea in isolation and can recite all three: ē, ĕ, and ā. He is given no words to learn with the ea phonogram, only the pure sounds. When he begins to read and sees a word with ea, he must decide which of the three sounds to use. Herein lies the fundamental flaw of the WRTR. If there were actual rules to help the child choose between the three sounds he has learned, then WRTR could claim to be an effective method of teaching accurate reading and spelling. Unfortunately, this is not the case. In the absence of rules, the WRTR child has been given no aids for or practice in reading words with the ea phonogram. The traditional phonics student, on the other hand, learns the three sounds of the phonogram ea in a logical order, one at a time. First he learns the most common sound, ē, and practices this phonogram with a selection of the more than 325 words that illustrate this sound: meat, each, real, speak, etc. Later he learns the second most common sound for ea, the ĕ sound, and again he practices this phonogram with a selection of the 150 words that illustrate this sound: bread, head, heavy, ready, etc. For the third sound of ea, the traditional phonics student learns only the three common words where ea has the sound ā: great, steak, break. Which do you think is the best way to teach students the phonogram ea? Learning every sound of the 70 phonograms is a daunting task which seems nearly impossible in the short amount of time Mrs. Spalding suggests for the first grader. But to make the task even more difficult, Mrs. Spalding prohibits the use of key words or pictures to remember phonogram sounds. However, for the teacher herself, she advises the aid of key words to remember and check her pronunciation. I can see why she advises this aid for the teacher, because it is imperative that the teacher master these sounds in order for the students to learn them accurately. However, if the teacher needs to check her pronunciation and aid her memory by using real words, how much more so the student? Why would we deny the child the same aid to memory and accuracy afforded the teacher? The only way for the child to learn the sounds of his own language is by segmenting them from real words that he can pronounce. There is no other way to accurately pinpoint these sounds. There is a real danger here that students will confuse and blur the 19 vowel sounds in English because a number are very close. To teach all of these vowel sounds in isolation runs the risk of confusing sounds that are close and learning them inaccurately. Dr. Orton’s program, like all traditional phonics, uses pictures and words for students to learn phonogram sounds. When learning the 70 phonograms, the child is denied the use of his own language to accurately hear and learn phonogram sounds. A second obstacle is then added when he is denied the opportunity to practice each phonogram in word families. Mrs. Spalding specifically scorns the use of word families. I didn’t have a phonics program when I was teaching my sons to read, but I made up word families for every phonogram I taught them because it seemed the natural thing to do. They did not have to learn ay as a random phonogram, but as a spelling pattern for many other words. Why would you withhold the information that ay is used in many other words and deny the child the opportunity to practice reading other ay words and enlarge his reading vocabulary? Dr. Orton teaches words in word families like all good phonics programs, and in Lesson 7 teaches the very words—will, bill, fill, kill, mill—that Mrs. Spalding so vehemently denounces. Additionally, Spalding omits the very important word families of consonant blends. Because they are not phonograms for one of the 45 sounds of English, Mrs. Spalding does not teach, nor make any mention of, the many initial and final consonant blends (e.g., br, cl, st). Blending consonants takes practice and is taught explicitly and early in all traditional phonics programs. In the Orton program, for instance, consonant blends are taught in Lessons 10-13, and are also included in the Orton phonogram cards. Many advocates of the Spalding method think that the reason our children never master spelling is because they have not learned the 29 Spalding spelling rules. They have the impression that these rules give students the guidelines they need to choose the correct spelling. If this were true, the Spalding method would be a scientific method of learning to read and spell with a high degree of accuracy. Unfortunately this is not the case. Most of the Spalding spelling rules are generalizations about the English language. They are somewhat helpful when teaching children to read, but most are not spelling rules. Most of her rules are awkwardly worded and some are unintelligible. We say sew, but also few? Doll and roll and home and some. This quote and the one below reveal that there are a number of similarities between the modern Whole Language or Look-Say method and Spalding. One is the rejection of sounding out words and the emphasis on reading whole words and reading for meaning from the beginning. The second is the teaching of words in the order of frequency in the English language rather than in the order of systematic phonics. The third is that Mrs. Spalding shares with the progressive educator a disdain for the beginning skills of learning to read. She scorns phonetic readers and word lists. Well, so much for The Cat in the Hat. Spalding and traditional phonics and especially the Orton method, with which Spalding is often confused, are completely incompatible. I think it is imperative that homeschoolers and especially the classical education movement use phonics and reading programs based on classical traditional methods that work. 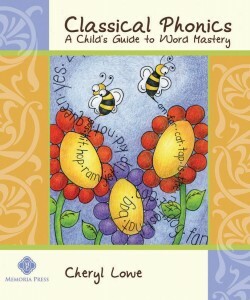 Phonics From A to Z, by Wiley Blevins, is an outstanding guide to phonics. I encourage those who want a greater understanding of how to teach reading to buy and study this guide. Be sure to read the earlier articles, How to Teach Phonics (And How Not To) Part I and What Is the Classical Approach to Phonics? Hello, I think you should look into and read through The Riggs Institute’s Writing and Spelling Road to Reading and Thinking. It is organically related to Spalding, but puts flesh and bones on it. It is designed for a classroom rather than a homeschool, unfortunately, and yes, the method (or its organization in this particular manual) can be so frustrating that several times I wanted to burn the book, BUT NOT FOR THE REASONS YOU ARGUE AGAINST THIS TYPE OF METHOD. With my oldest 2 sons, we used the Level I manual in K-2, and the results were phenomenal. When I needed to switch to a “less parent intensive” plan for them, I chose IEW’s Phonetic Zoo Spelling (just the discs). The older one tested into their high school level spelling, and the younger one into their middle school level spelling. With my 3rd son, I was too busy to do the full Riggs program with him, and I regret that. He is a much slower reader and much poorer speller than his brothers. This is because armed with the phonogram sound possibilities and spelling rules as a common language between myself and my older sons we could easily work through personal spelling issues dialectically. Without the thoroughness of the spelling rules in Riggs, I cannot easily converse with my 3rd son about spelling issues he is having. 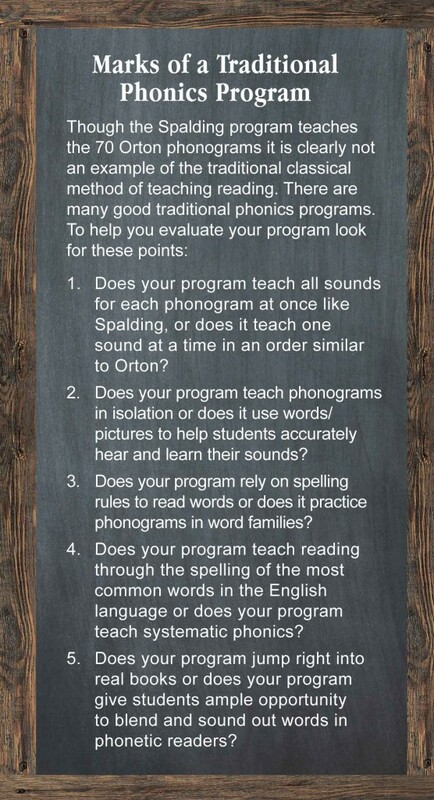 You state in another article: “A nontraditional approach to phonics, developed in the last half of the 20th century, requires students to learn all the sounds for each phonogram initially and to use “spelling rules” to apply them. These programs subordinate reading to spelling and make the process of learning to read unnecessarily complicated. The art of teaching is not to take something relatively simple and obfuscate, but to make the complex simple and easy to understand.” I must say that while the Riggs method IS initially difficult for the parent to grasp, my experience is that the children learn to read very quickly with it, and are not at all limited to graded readers. My older son did most of his reading learning in a large storybook compendium, and my second son in a catechism devotional. With this, I did not have to worry as much about choosing reading material by decoding ability, but by comprehension ability, while it seems like many children learn to read on simplified materials which are below their comprehension level (and thus often boring) by necessity to keep on par with their decoding level. I haven’t read either of Spalding or the Riggs manual recently enough to remember (honesty here), but I don’t believe either of them would say a child should not or cannot read before he/she can spell, but that for kids who cannot yet do either, this is an ideal method by which to learn. I remember something about how the ABC song is misleading b/c it is the names of the letters rather than their sounds, thus adding an unnecessary layer of learning to the task, b/c the names of the letters are useless to reading. But what parent doesn’t teach the ABC song, and basic visual letter recognition?? We just do it. I think it is culturally ingrained. My 3yo knows her letters. However, armed with the knowledge of the phonogram sounds, I am casually/randomly teaching her the sounds that each letter can make. She is 3, and because she can’t read, she has no problem with learning letter sounds in isolation of context. She thinks it is funny that s says s, z, and like a 3yo does, she repeats those random tidbits at random times. She does not know how to write yet and does not possess the instruction comprehension yet to do so. However, I do think that the basic premise behind the teaching method–the MULTI-SENSORY nature of the skill acquisition (auditory, visual and kinesthetic) and VERBAL nature of the instruction are superior in their result WHEN they can be successfully applied. I have 2 children with verbal comprehension problems for whom the handwriting instruction needed modification. The same instructions were used, but the paper needed to be modified (in stages promoting independence and the move to ordinary handwriting paper) and I produced videos for them demonstrating the verbal instructions. The Riggs manual approaches basic grammar in a way that also produced excellent results. Truth be told, I also learned how to use Socratic questions in other contexts from this manual, as well as instructional methodology that has served us well in a variety of contexts. A page of instruction can be dictated to students (it doesn’t have to be dry, and in fact, the material can often be presented socratically), for which they can be asked to keep and learn and refer back to as the model or measure of their work. I have found in my experience that often material presented and used in this fashion can eliminate the “need” for tedious textbook activities, and that the learning itself is both more personal and more permanent. I stumbled across these phonics articles while looking at Latin curriculum. My older son is in 2nd year high school Latin, and he says that of all the books he has used, the format of First Form Latin is by far the best. He has been exposed to 5 different formats, including First Form and Henle, and has nothing but praise for First Form.